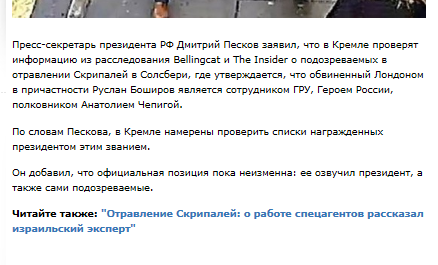 When Peskov claimed the Kremlin “will [sic] check information from the investigation of Bellingcat”, more than twenty-four hours had already passed since he had first seen the Bellingcat report on Boshirov and Chepiga. That Peskov did not already have the GRU file on Chepiga, the Hero of Russia list, and the relationship between Chepiga and Boshirov is impossible. On Thursday Putin was travelling. He stopped in Baku, Azerbaijan, to attend a world judo championship and to meet Azerbaijan’s President, Ilham Aliyev. He then flew to Tajikistan where he had dinner with government leaders from Azerbaijan, Belarus, Kyrgyzstan, Kazakhstan, Moldova, Uzbekistan, Armenia, and Turkmenistan. On Friday they plan a summit conference together. The Kremlin photographs indicate that for this trip Putin left Peskov at home. Putin was still eating in Dushanbe when MK posted its report from Peskov. The last paragraph refers to the President’s impromptu statement on September 12 in Vladivostok. Putin was asked about British identification of the two suspects in the Skripal case, named in London as Ruslan Boshirov and Alexander Petrov. For that story, read this. This is how Putin responded. 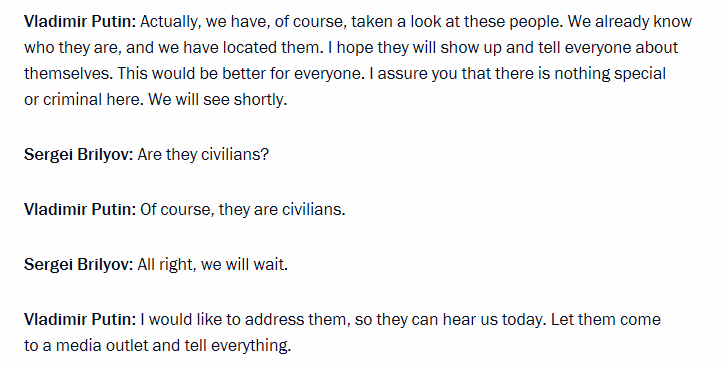 “Of course they are civilians” – Putin may not have been expecting the question from Sergei Brilyov, a reliable interviewer of high state officials and anchor of Vesti V Subbotu (News on Saturday) broadcast on Rossiya TV Channel. Businessmen engaged in importing vitamin pills, energy drinks and health powders was also what Boshirov and Petrov said they were on the next day, September 13, in a televised interview on RT. In the two weeks which elapsed since then, Russian media investigations of Boshirov and Petrov have picked apart what the duo claimed for themselves, and also the allegations by the Metropolitan Police in London. There is still no Interpol Red Notice for either man, although the British announced they had applied to Interpol more than three weeks ago. On Thursday morning the entire London press opened the file on Colonel Chepiga. Here is one of the versions. The Telegraph declared through its “chief reporter” that Bellingcat was an “investigative journalist organisation”, and that its sourcing for the Chpegia identification had come from Bellingcat “in conjunction with The Telegraph”. Other British media ignored that selfie. The Telegraph followed later in the day with the claim that in addition to Petrov and Boshirov aka Chepiga, “a third Russian military intelligence officer who carried out a reconnaissance mission before the poisoning of Sergei Skripal has been identified by counter terrorism police and the security services, the Telegraph understands.” As the passive reflexive tense used for sourcing has spread across the London media, no fresh name has been reported, nor a government official to put his or her name to the charge. Read the Bellingcat report on identification of Boshirov with Chepiga. There has been no Metropolitan Police statement or tweet of this name allegation nor confirmation from the Office of Public Prosecutions; they are the government organs responsible for investigation of the Salisbury poisonings, and for issuing indictments, arrest warrants, and the papers required for a criminal court proceeding. To date, no evidence and no charges have been presented in a British court. 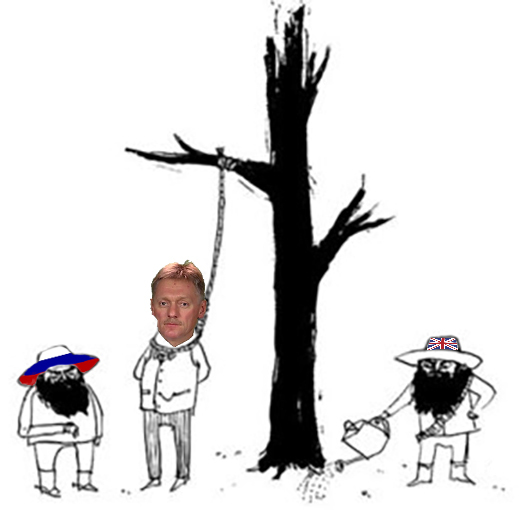 The New York Times reported: “The police in Britain would not comment on the report”. 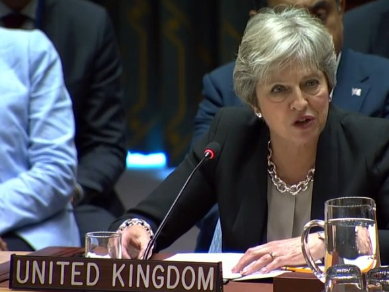 Prime Minister Theresa May, who spoke twice at the United Nations on Thursday, has also avoided making the Chepiga allegation. Max van der Werff, the independent Dutch investigator of the Malaysian Airlines MH17 case, has spent years in detailed examination of similar Bellingcat allegations based on social media, video clips, photographs and identity matches, in order to accuse named Russian soldiers of shooting down the aircraft in July 2014. For details of van der Werff’s work on that case, start here and here. 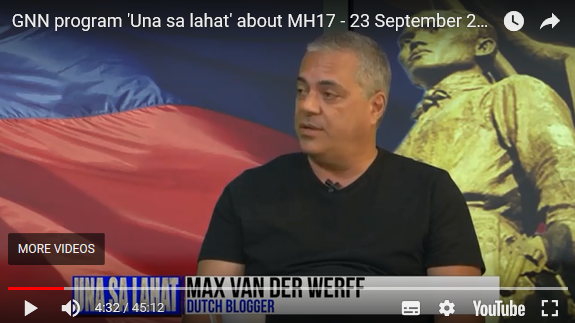 Max van der Werff on Philippines television this week discussing the evidence of the MH17. Three Filipinos were killed on board the aircraft.